Many of us have this strong relationship to the food we ate growing up. You know what I am talking about? Those home cooked meals that totally bring you back to when you were a kid? It’s almost strange in a sense but we build this connection or association to that food with a pretty amazing indescribable feeling. 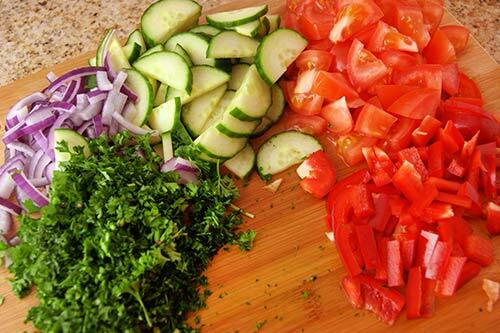 This salad is one of those for me! 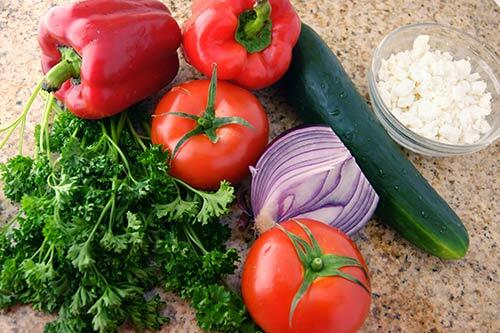 As many of you know I was born in Bulgaria and my all Bulgarian family ate a lot of Bulgarian food growing up. 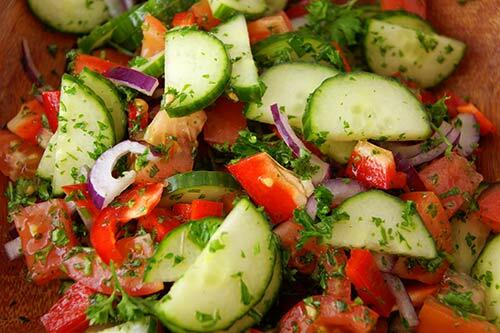 So yes, this salad comes from Bulgarian and its quite spectacular! We ate this a lot growing up. The combination of the peppers, tomatoes, cucumbers, red onions, parsley and the optional feta cheese go so well together. 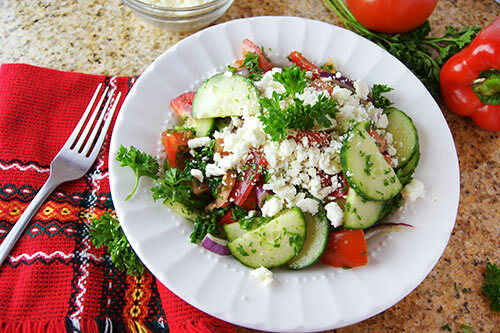 It is a healthy dish with or without the feta cheese and would be a perfect salad to enjoy for lunch or as a side dish. I actually make this salad quite often yet I usually leave out the cheese but sometimes enjoy it with it. The traditional Bulgarian version has the feta cheese in it which is fitting since the colors of the salad are white, green and red which are also the colors of the Bulgarian flag (in that order). If you do decide to add in the feta cheese make sure to find some good quality feta. It may be because I am so used to the Bulgarian feta cheese that most others don’t taste good to me but I know what to look for when I buy it. If possible try and find one made in Bulgaria (many of the European stores carry them).